The Climate and Health program supports the health care sector in reducing its carbon footprint, building climate-smart and resilient hospitals and communities, and mobilizing health care's ethical, economic, and political influence to advance the transition to a low-carbon future that supports healthy people living on a healthy planet. The Lancet Commission characterized climate change as both the "biggest global health threat" and "the greatest global health opportunity" of the 21st century. Climate change is already damaging human health and will have a greater impact in the future. The health effects of these disruptions include increased respiratory and cardiovascular disease, injuries and premature deaths related to extreme weather events, changes in the prevalence and geographical distribution of food- and water-borne illnesses and other infectious diseases, and threats to mental health. Children, the elderly, people with chronic illnesses, and low-income communities are especially at risk. Health care is on the frontlines of climate change, bearing the costs of increased diseases and more frequent, severe extreme weather events. If we act now, the worst effects of climate change can be prevented, and such prevention presents a significant opportunity to simultaneously improve health outcomes. The health care sector has a unique responsibility and opportunity to act. Health care has a healing mission and has committed to “do no harm,” yet its operations contribute significantly to climate change, and as a result, to the very diseases it is trying to treat. The health care sector’s greenhouse gas emissions make up 9.8 percent of the U.S. total. If it were its own country, health care would rank 13th in the world for greenhouse gas emissions, more than the United Kingdom. We envision health care as a climate-smart, innovative sector that protects public health from climate change and accelerates the transition to a low-carbon economy while improving community resilience, health equity, and access to care. Representing 18 percent of the U.S. GDP, the health care sector can have an outsized impact on the economy by using its purchasing power to drive the transition to clean energy and a low-carbon supply chain. Hospitals are often one of the largest local employers, making them valued anchor institutions and essential partners for advancing mitigation and climate resilience strategies in the communities they serve. Hospitals not only have a stake in directly addressing climate change, but they can also help reframe the climate change debate—focusing on clean air, healthy communities, and lower health care costs. Health care can make the case— with its ethical, political, and economic clout— that it is in the interest of both human and planetary health to mitigate climate change and, in doing so, improve population health. Health Care Without Harm works to foster climate-smart health care in hospitals and reframe the climate debate by broadening the conversation to include a powerful public health dimension. Mitigation: The health care sector radically reduces its own carbon footprint and implements low-carbon health care delivery, using its supply chain leverage to drive the market transition to a low-carbon economy. Resilience: The health care sector prepares its facilities for climate impacts and helps to build community health and climate resilience. Leadership: Health care institutions and professionals act as critical messengers for rebranding climate change as a public health threat and become powerful advocates for climate-smart policies at all levels of government and in health care oversight organizations. The ultimate goal is for health systems to start by doing no harm, mitigating direct fossil fuel emissions so that the delivery of health care creates no negative health impacts, and to evolve to a healing role, building community health and resilience and creating conditions for communities to thrive. Contact a member of the U.S. Climate and Health team. Across the United States hospitals and health systems are committing to do their part to address climate change. Our Climate Action Playbook shows how hospitals are saving money and protecting the health of their patients and communities by implementing climate-smart health care. Hospitals can commit to climate-smart health care by joining the Health Care Climate Challenge. The Health Care Climate Challenge provides participants with easy-to-use resources to help support climate-smart solutions and a login to submit data. Health professionals can use their trusted and credible voices to advocate for climate solutions both in their clinical settings and in their communities. There are many opportunities for health professionals to support the transition to climate-smart health care in their hospitals, including starting or joining a green team, educating their colleagues, or by making the case for climate-smart health care to leadership. 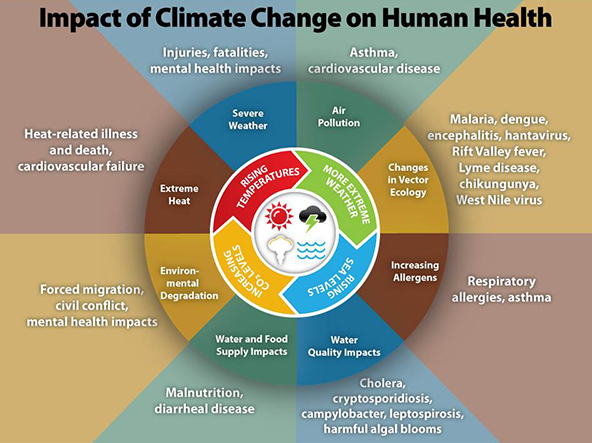 Health professionals can also educate their patients and communities about the health impacts of climate change and advocate for the development and implementation of local, state, national and international climate solutions. Health Care Without Harm’s Physician Network supports emerging and established physician leaders in leveraging their influence and expertise to advance the growing health care sustainability movement and to create climate-smart health care.